For years my wife and I have enjoyed Oishii Japanese Restraunt. The sushi is always fresh, and the service is always great. One other thing kept us coming back. Their prices are the cheapest in Houston. My favorite is their Happy hour 3PM - 7PM weekdays. 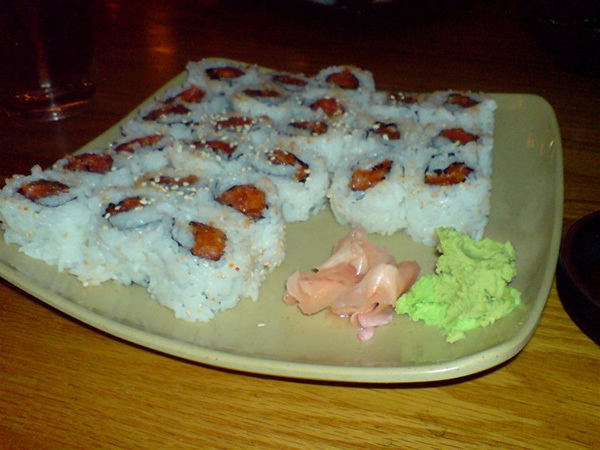 Buy one get one free on several rolls including spicy salmon. Normally you get 6 pieces for $4.00. During happy hour you get 12 pieces for $4.00. My wife and I could walk in and walk out stuffed with sushi, for under $20 including Tip. The place is not very big. I would estimate it has a capacity of only 60 people. Its a little family owned and run sushi place. I don't even bother with other sushi places. It seems when we go somewhere else we end up with a $50+ bill. and the wait staff was sub par. Oishii is located off Richmond close to Greenway Plaza. We used to make a date night out of it. Hit Oishii for the best Sushi in Houston, and then hit a movie at greenway. I highly recommend everyone give them a try, especially in this economy.